Sports Direct | NUFC Blog. Archive for tag: Sports Direct. What was Newcastle United’s £498,000 payment to Sports Direct for? Firstly, I should declare that this piece was originally inspired by another, one of several on Newcastle United’s finances by a brace of accountants who also happen to be Toon fans in the latest issue of fanzine, ‘True Faith.’ It’s a very good read. Of course, it has been known for quite some time that Sports Direct don’t pay a brass farthing for all the extensive worldwide publicity they get from Newcastle United. This was something which was finally confirmed by the club’s financial director, John Irving, at the first ‘Fans’ Forum’ meeting between representatives of the fans, the club, and sponsors, Wronga. 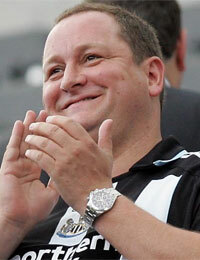 Mike Ashley: Laughing all the way to the bank again. With the news that Mike Ashley’s downmarket sports chain, Sports Direct, is about to be included in the reshuffled FTSE 100 Index of the top 100 UK companies, I took a peek at their latest figures, as I do from time to time. As has been the norm with Sports Direct for quite some time now, the figures were obscene, with profits rising a whopping 23.2% to £260.1 million. What caught my eye however was the current Sports Direct share price standing at well over £7 and rising three or four times just as I was reading it over the share ticker. This means that Ashley’s current 64% holding in Sports Direct International is now worth over £2.75 billion, and this is after Ashley cashed in some 4% of his shares for over £100 million back in February. The fans are revolting, but Will they be effective this time? Newcastle United fans are revolting! However, writing as someone who used to be an protester and fundraiser myself in the past, not over Newcastle United but over causes such as civil liberties, racism and the like, from what I have read and seen of Newcastle United fans’ planned protests so far, the chances of success don’t seem to be that great at all. This isn’t because the protestors don’t have a case, more that the protagonists don’t seem to be protesters, quite simply, they don’t know how to do it properly. They’re more like brickies and plumbers who are blundering around in a field they don’t understand, a bit like Mike Ashley trying to run a large Premier League football club really! 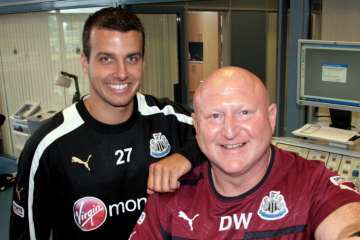 Newcastle United’s new training kit sponsor – Sports Direct! S.Taylor and Derek Wright displaying the new SD arm patches. It seems that Newcastle United have somehow managed to pull off yet another sponsorship deal with sportwear giant, Sports Direct, this time for the club’s training kits. This adds to the company’s existing sponsorship of St James’ Park stadium, the pitchside hoardings, the roof, the walls, the players’ tunnels, the dugouts, the Benton training ground, Kath the tea lady and so on. The amount agreed for the latest “sponsorship” remains uncertain, but whatever it is, here’s hoping that it’s at least something. Despite finishing in the top five last season, qualifying for the Europa League, and reaching complete saturation in terms of sponsorship opportunities, Newcastle United still receives one of the lowest amounts in sponsorship revenue in the Premiership, and is currently £140 million in debt, the highest figure in it’s history. Random gripe about the random Toon. Fair enough, but what’s with all this nonsense about giving Hughton a million or two to buy some players as if it was some unplanned afterthought? I mean, what’s his transfer window budget for January, the summer, the January after that? Surely if he’s ‘totally committed to the future success of Newcastle United’ he’s made financial projections for some years ahead, established his incomings and outgoings and got some sort of business plan for rebuilding the club that takes into account various scenarios (such as succeeding or failing to get promotion).